Dreaming of a hassle-free, worry-free and a relaxing shopping spree this holiday season? Worry no more for we have found you a very comfortable and easy shopping arena where you can find your and your family’s best needs this holiday season! Shopee, one of the leading mobile marketplaces in Southeast Asia and Taiwan, announced the November 11 launch of its Shopee Christmas Time Deals, officially starting the online shopping holiday countdown. Known for celebrating the longest Christmas season in the world, Filipinos will be able to enjoy thousands of deals on a lot of items they want and need, ranging from lip kits, today’s trendiest clothes to some of the most popular toys of the year. "Our buyers and sellers love getting and giving the best deals on the holiday season's hottest products. Our Shopee Christmas Time campaign allows them to do that most conveniently on their phones while enjoying Free Shipping on their orders," said Macy Castillo, Head of Commercial Business at Shopee. This Christmas, just save your time for those who matter most to you, the reason why Shopee is offering more deals than ever before. Shopee wants you to buy your perfect gifts anytime, anywhere rather than spend time in traffic or weave your way to crowded malls. What are you waiting for? 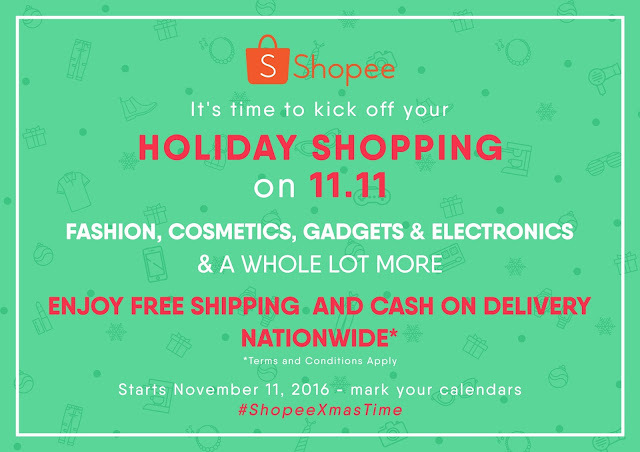 Download Shopee now and enjoy great freebies when shopping. Shopee will be having multiple promos throughout this Christmas period, with discounts up to 88% off, Flash Sales, and surprise gifts among others. Filipinos may download Shopee on the App Store and Google Play for free.